Corporate non-financial statements and ethical codes of conduct serve as a basic indication of the organisations’ credentials on social and environmental responsibility. This contribution sheds light on some of the major benchmarks, guidelines and principles for corporate social responsibility (CSR), corporate governance and sustainability reporting. It reports on different actors and drivers who are currently shaping CSR communications and policies in their relational frameworks. Very often, corporate businesses use non-governmental organisations’ (NGOs) regulatory tools such as process and performance-oriented standards in corporate governance, human rights, labour standards, environmental protection, health and safety and the like. Many NGOs are offering certifications for compliance with proposed principles and guidelines – as they incorporate independent monitoring and assurance systems (Berkhout et al., 2008). For example, the social accountability standard SA8000 maintains a universally accepted ‘working conditions standard’ throughout the global supply chain (Reynolds and Yuthas, 2008:51–52). This standard is applicable in a wide range of industry sectors and can be employed across many organisations (Jiang and Bansal, 2003). Interestingly, the multinational businesses which implement regulatory principles and standards have committed themselves to integrate responsible practices into their very own management systems. Such positive developments may translate to the incorporation of relevant standards on human resources management and training, strategic planning, supply chain management, as well as in other departments. The following are some of the most popular standards and reporting instruments: Accountability’s AA1000, British Assessment’s – OHSAS 18001, Eco-management and Audit Scheme (EMAS), Global Reporting Initiative (GRI), Fair Labor Association (FLA), International Standards Organisation’s ISO 26000 – Social Responsibility International Standards, Organisation’s ISO 14001, Environmental Management System, Social Accountability’s SA8000 and the United Nations Global Compact among others. At the moment, there is an ongoing discussion on the gap between theory and reality concerning corporate social responsibility (CSR) policy and practice. Sustainability reporting instruments and standards for social and environmental performance including industry-based certifications (e.g., SA8000; ISO 14001) and product-based standards (e.g., Fair Trade) have grown in number, particularly during the past decade. SA8000’s focus on the establishment of management systems has been drawn on the experience of the well-acclaimed ISO 9000 and ISO 14000 standards (Leipziger 2001:9). SA 8000 configures the requirements on social evaluation, as it specifically refers to forced labour, freedom of association, discrimination, working conditions as well as other issues. In many cases, these standards have been taken up voluntarily by businesses themselves. Such instruments signal the firms’ responsibility credentials towards their stakeholders (Simpson et al., 2012). Nongovernmental agencies have developed these standards to certify types of manufacturing practices (e.g. ISO 14001 and OHSAS 18000) so that firms can identify responsible suppliers and niche producers. The largest global suppliers are increasingly realising that it is in their interest to remain honest and fair in their procurement contracts, dealings and advertising. Similarly, many consumers are also becoming acquainted with organic certifications and ‘Fair Trade’ initiatives that can possibly improve the branding of products with unique characteristics (Fair Trade, 2012). It may appear that these instruments and principles on environmental, social and governance disclosures are providing adequate guidance to responsible businesses who are voluntarily applying predefined norms and procedures in their social and/or environmental issues. These CSR reporting parameters and their standards are usually applied in different industry sectors and geographic regions (Leipziger 2003:37), and their use is proliferating. Many multinational businesses are following certain sustainability guidelines, such as SA8000, AA1000 and the GRI. The latter one, GRI grew out of a joint initiative between the U.S. Coalition for Environmentally Responsible Economies (CERES) and the United Nations Environment Programme. This reporting initiative complements extant financial reporting frameworks with non-financial disclosures on environmental matters. De tomasi (2006) held that the formulation of the GRI codes have emerged following the fruitful and collaborative agreements involving industry and government groups. Most of these codes are issue-specific, as they were designed to improve the reporting requirements, particularly in the areas of social and environmental impact assessments. Most of the non governmental organisations’ CSR standards are often related to soft law solutions as they are not legally binding. The compliance with these principles on responsible behaviours is voluntary, and cannot be legally enforceable. However, such instruments may act as a precursor, as they could possibly pave the way for harder legislation. In fact, many CSR regulatory instruments seem to fill numerous governance and accountability gaps for which there was no applicable law or enforcement. Interestingly, the U.S. Occupational Safety and Health Administration (OSHA) have converted a large number of voluntary health and safety standards into regulatory requirements. Moreover, the Brazilian state of Acre has made certification under the Forest Stewardship Council’s ‘sustainable forestry programme’ a compulsory requirement for the practicing of forestry in the state. In a similar vein, Zimbabwe has incorporated ISO 14001 into its regulatory system (Stenzel, 2000). Nonetheless, the quality of the ISO 14001 has often been criticised altogether (Mueller et al., 2009). A study by the University of Sussex among 280 companies has indicated that ISO 14001 certified companies were not so different than other companies without an ISO certificate. This study indicated that the employees’ behaviour has hardly changed following their certification (Berkhout et al., 2008). In the main, voluntary standards have been developed to ensure that big corporations remain accountable and transparent to stakeholders, including investors, suppliers and employees (amongst others). All stakeholders will continuously scrutinise the businesses’ credentials on responsible behaviours and their non financial performance. Therefore, it is in the companies’ interest to anticipate any regulatory intervention in this regard. Many firms are increasingly pledging their commitment to fulfill some of the most stringent requirements of the NGOs’ instruments and tools for environmental, social and governance disclosures. It is hoped that such principles and guidelines will help to bring further improvements in the organisations’ responsible procedures, for the benefit of all stakeholders. Camilleri, M.A (2015) “Environmental, Social and Governance Disclosures in Europe”. 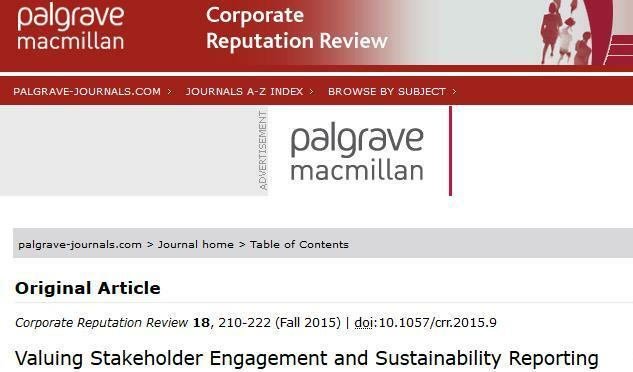 Sustainability Accounting, Management and Policy Journal 6 (2) pp.224 – 242 http://www.emeraldinsight.com/doi/abs/10.1108/SAMPJ-10-2014-0065. Petroleum refineries have been identified by the U.S. Environmental Protection Agency as one of the major sources for emissions of hazardous air pollutants. The largest number of active petroleum refineries in the United States is located in Texas. The stringent federal and state environmental regulations and mandates imposed on this industry are only part of the solution in managing such emissions. Following the concept of corporate social responsibility, specifically corporate environmental responsibility, the petroleum refining industry in cooperation and collaboration with its key stakeholders may be more successful in controlling and reducing emissions of hazardous air pollutants from its operations. This study performed a quantitative evaluation of the relationship between stakeholder’s influence and corporate environmental responsibility efforts of the Texas petroleum refineries and offers suggestions for future action by the government, non government organizations and the community.